Of all the people I interviewed, there was no one I respected more than actress Beverly Garland, who never became a big name in Hollywood, but could handle almost any role and always lent a touch of class to every movie and television program that hired her. And that took some doing – because Beverly Garland was in some of the worst movies ever made. She also was considered a good luck charm for producers of television pilot films, who often turned to her to fill guest roles, particularly on dramatic series. I talked to her twice, the second time over the phone. This is an excerpt from a 1969 story written after she called the Providence Journal. Beverly Garland is an attractive, accomplished actress who has been in the business about 15 years. She has paid her dues, as some are wont to say, but she has not been rewarded with stardom or with many roles equal to her talent. “I’m not saying this because I want to toot my own horn, or anything,” she said, “but I consider myself a very good, very competent actress. The reasons I never became a star are, one, bad management, and, two, the fact that I am not a very social person. I’ve never gone to the right parties or mixed with the right people. Garland has generally been available only for spot or special work. Included are such things as a role in “Pretty Poison,” the recent Tuesday Weld-Tony Perkins movie that drew excellent reviews, but very poor attendance. She has been cast as a guest star in 16 television series pilot films. All 16 were sold, starting with “Medic” many years ago. She won an Emmy nomination for her performance on that show. This season she’s coming in from the bullpen to offer relief to “My Three Sons,” a long-running TV comedy that is making another effort to get out of a rut. Two years ago one of the sons got married; last year he and his wife had triplets. 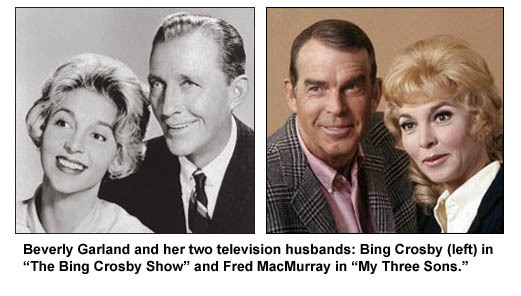 Now the plan is for Garland to enter the picture and sweep widower Fred MacMurray off his feet and down the aisle. “I think I’m very lucky to get this show. They interviewed a lot of actresses for the part and somehow offered me the role. This surprised me because I felt they were looking for a very pretty woman, and I don’t consider myself a pretty person,” she said. The show’s unusual schedule was set up to accommodate MacMurray, who make himself available only for a limited period of time each year. As a result, all scripts for the season have to be ready before the first day of shooting. Because the show will develop the relationship between Garland and MacMurray, there will be an unusual sense of continuity this season. The couple met during the first episode and the courtship will continue for about six more until the wedding takes place. That was understandable because her early career was a never-ending procession of roles in which she was bad and tough, or good and tough, or bad and troubled, or good and troubled. Rarely did she exhibit a sense of humor. It wasn’t appropriate for her roles. Occasionally she did a science fiction film, perhaps her blandest kind of role, but acting in these restricted her to sticking out her chin and keeping a stiff upper lip. “I got stuck in those ‘great’ movies – like ‘Curucu, Beast of the Amazon’ – because I let my managers completely run my career. I never had initiative. I thought I was a capable actress, but unless someone led me to an audition, or at least pointed the way, I just wouldn’t go. There is no bitterness in her voice. Beverly Garland made her choice a long time ago. She seems very happy being Mrs. Filmore Crank, mother of two, Carrington, 5, and James, 13 months. And if she can continue to do a little acting on the side, so much the better. HOLLYWOOD – If someone were to poll performers to determine which of their flock is most deserving of whopping success, chances are the winner would be Mrs. Fillmore Crank. Mrs. Crank – okay, Beverly Garland – has been a professional actress more than 20 years and is a battle-scarred veteran of more grade Z Westerns and science fiction films than she cares to remember. Beverly Garland also is a good luck charm for television producers and since 1954 has been tapped as the guest star in 12 pilot films that were turned into series. No other performer has helped kickoff so many shows. She also is capable of delivering a fine performance and proves it about 15 times each season in TV guest shots. But Beverly Garland is not a star. Not yet. She hopes to correct the situation this season when she co-stars on the new “Bing Crosby Show” for ABC. Garland has had roles on two previous series, but neither was a success. One was “Stump the Stars,” the other was “Decoy,” in which she became television’s first policewoman. Spoken like a California native, which she is. Except for Crosby’s name, which may not hold the magic it once did, his program appears little different from other situation comedies. He’ll be an engineer who sings in his spare time. Garland, as his wife, will be a woman with theatrical ambitions, but no talent. There will be two daughters in the family (played by Diane Sherry and Carol Faylen, daughter of Frank Faylen, best-remembered as the TV father of Dobie Gillis). She has spent a good part of her career in Westerns because she needed the work and the price was right. She might have had a better time working in a coal mine. “In my first Western I had to fire a rifle on horseback. I reached down for the rifle, but the horse reared up at the same time. I broke my nose in two places. “In my next Western I was required to run down a flight of stairs, dash into the street, jump on a horse and ride away. The first time I jumped too high, tumbled over the horse and landed on my face. “When we did the scene again I fell down the stairs and broke my ankle. Another time I was thrown off a horse, landed on a cactus and gashed my leg. “Even when Walt Disney tried to help I got hurt. He signed me to do ‘Elfego Baca’ and told me to get acquainted with my horse before we started filming. I got along fine with the horse, but broke my ankle while dismounting. “Even when I don’t go near horses I get into trouble in Westerns. Two years ago on ‘The Dakotas’ I was supposed to get killed in the final scene. The scene was filmed in the rain and the street was quite muddy when I got ‘shot.’ I was careful to land where I couldn’t get too dirty. “But the fellow playing my brother comes over, cradles me in this arms for a moment ... you know, he looks down and says, ‘Gee, she was really a good kid’ or something like that ... and then drops me back in the mud. “The water started getting into my nose and mouth. I tried to wait out the scene, but I couldn’t. I had to jump up. I remember screaming for dear life. Then I was told to get cleaned up and come back and do the same thing over again.